We are noticing more and more that water heaters just don’t fit anymore. Clients with water heaters inside closets and 3 walled cubby holes are discovering that the same gallon capacity that they currently have doesn’t fit anymore. Water heaters have undergone quite the transformation over the last few years increasing both their size and their price. On April 16, 2015, water heaters took the next step in their evolution to be more energy efficient. Water heater manufacturers had to comply with new Department of Energy (DOE) efficiency standards. The most common water heaters manufactured are 55 or less gallons, and after this date received a modest boost in efficiency, while units 55 gallons and larger shifted to next-generation technology, possibly cutting utility bills by one-fourth to one-half depending on the technology. Which water heaters were affected? DOE estimates that the new efficiency measures will save 2.6 quadrillion Btus (quads) of energy over 30 years and net consumers up to $8.7 billion in savings. Over the same period, the standards will reduce CO2 emissions by 154 million metric tons. To put these long-term savings in perspective, the savings are enough to meet the total energy needs of 13 million typical US homes for a year, and the CO2 savings are equivalent to taking 32 million passenger cars off the road for a year. Something the DOE perhaps didn’t estimate was that water heaters would have to increase in size to accommodate the new energy standards, and the initial cost of a water heater replacement would go up as well. Tank style water heaters with a gallon capacity of 55 and under, the new standard increased the efficiency of typical-sized units by 4% on average. Manufacturers met the efficiency levels with incremental improvements to improved heat exchangers (gas) and more insulation. 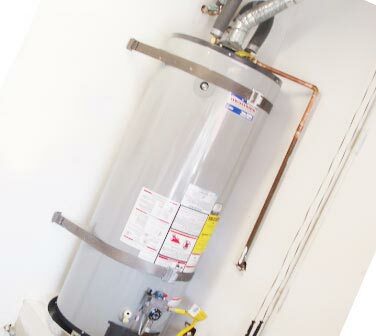 efficiency for Tank Style water heaters over 55 gallons Get big modifications. Water heaters larger than 55 gallons saw a much bigger jump in efficiency. The new standards for these larger water heaters can be met using electric heat pump and gas condensing technology. Heat pump water heaters save at least 50% and condensing gas units about 25% compared to the water heaters previously on the market. The table below shows the previous and new standards for typical-sized tank style water heaters The water heater standards vary as a function of tank size. The energy factor (EF) is the ratio of useful energy output from the water heater to the total amount of energy delivered to it. 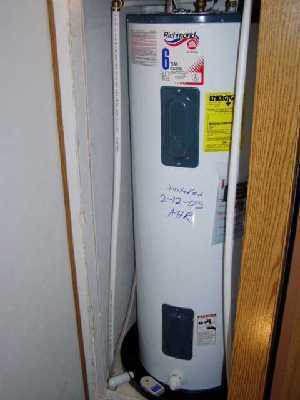 Manufacturers have had to adjust the height and/or diameter of tank style water heaters by 1 to 2 inches due to added insulation (some less than an inch). For many homes, particularly those with basement installations and open access in the garage will likely not be impact by the increased size, while clients with space constraints (e.g., water heaters in closets or crawl spaces) can be expected to have to accommodate for the size increase, our professional installers will provide you with options so you can make an informed decision that is right for your household. There are options out there from special order water heaters, tankless versions as well as a downgrade in gallon capacity with an upgraded booster pump. We are here to help you navigate the new upgrades and make the process as painless as possible.